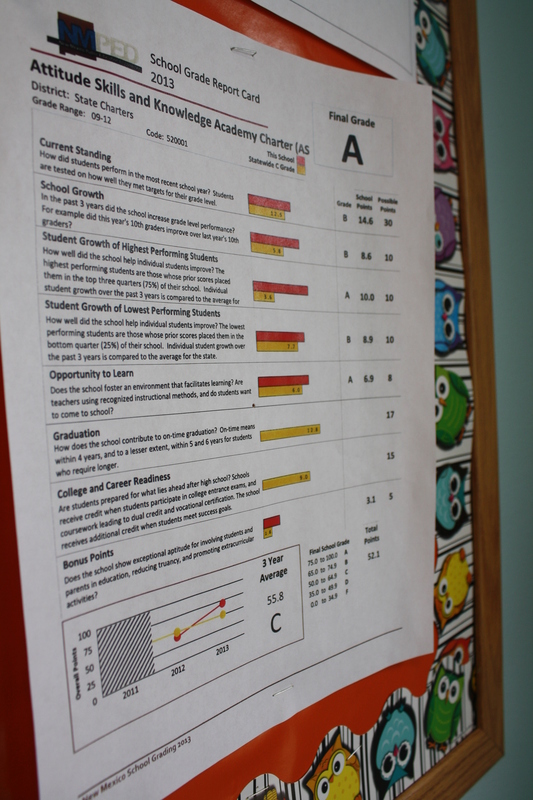 The ASK Academy’s report card from the Education Department hangs on the board in the front office. The ASK Academy marked its fourth year in 2013, and is still a new, growing school. With growth, comes growing pains. The Academy groaned when it received a D letter grade for the 2011-2012 year, a grade often thought by the ASK community as undeserved. That’s in the past now as ASK garnered an A grade by the New Mexico Public Education Department in June for the 2012-1013 school year. Many factors played into both outcomes; the school receiving a D, as well as the turn around to achieving a more rewarding evaluation. What determines the grade a school earns? Schools across the state are judged by the same standards and receive a report card from the NMPED showing exactly where and how the school exceeds or fails to accomplish the task. The major categories that are looked at are students’ proficiency in math and reading, graduation rates, whether or not the school offers sufficient ways for students to learn, as well teaching methods. Graduation rates and preparation for students for college and careers are also areas that are considered. Growth and improvement from year-to-year is another big aspect of the report card. The growth aspect of that grade was one of the strongest contributing factors to the Academy receiving a D two years ago. That growth is measured by the ability of 11th graders. Paul Stephenson, math project manager and co-founder of ASK, said last year was the first time the new system was rolled out, and there were certain aspects of the grading rubric he believed to be erroneous – like accountability for a class that had not existed the year before. “We didn’t even have a junior class to compare the next junior class to. The fact that there wasn’t a graduating class that year either didn’t allow the school to be graded in that category, so the grade was adjusted for that element,” he said. Stephenson believes that the D grade was not a true reflection of the school at the time and was an ‘undeserved black eye’, where a B would have been more accurate for the school that year. The ASK Academy actually went through an appeal process with the state department, where the opinion of the grade can be voiced. However, nothing came of this, he said. “If we’re playing a game, then we have to know the rules. It helps you play the game better. We learned the rules,” Stephenson said of the higher grade this year. However, the school hasn’t had to bend its back to meet the needs of the rubric according to Stephenson. The Academy was doing what it needed to previously, but has gotten better at communicating its actions in order to meet the standards of the system. The school also showed vast improvement from year to year in the grade level scores. The ASK Academy’s improvement isn’t just seen through the report card and statistics, Stephenson said. He said the mission and driving goals of the Academy are being met. The curriculum is heading toward what founders dreamed of – academically challenging and preparing scholars for the future. In addition there are more courses, extracurricular activities, and increased involvement from parents. More STEM partners are being involved. The above average ACT scores are another indicator of improvement. “We’re not saying so much, ‘We’re going to be doing these things.’ We can now say ‘Oh, we are doing those things’ and even, ‘We did those things,’” Stephenson said. While the Academy is proud of the high marks, Stephenson admitted the high grade isn’t as an impressive achievement as it seems. Among all of the New Mexico high schools that received grades, very few didn’t get A’s or B’s. “It’s sort of like being a student in a class. ‘Hey Mom I got a 100!’ … So did everybody else,’” he said. In other words, although a high grade seems exceptional, when all the other schools are supposedly doing the same thing it doesn’t necessarily feel so exceptional. However, the system by which schools are graded is still a relatively new one. As time goes on, there may be fewer schools with such high grades, with an increasingly rigorous baseline of how schools are judged. “We can’t rest on our laurels – we have to keep working,” Stephenson said. As more STEM partnerships are formed and the missions are being met, he hopes The ASK Academy will become a model for other schools. Envisioning an even further goal, the plan is that other ASK Academies across the nation will pop up and emulate what the Academy now demonstrates. this information helps students by letting them know that we need to step up our tasks. this information showing scholars to step on their grade.